This morning the Federal Communications Commission (FCC) voted to eliminate its sports blackout rule, which helped the NFL justify blacking out the broadcast of NFL games that were not sold out. The blackout rule was always a case of the FCC getting government involved in the business model of a company/league, which is always a mistake. Policy and business models should never be confused. Government sets policy, and then people go out and create business models. Government should not be creating or distorting or assisting anyone's business model. This past week I filmed an episode of the McCuistion program, a public affairs TV show that airs around the country, and the topic was net neutrality. It should air in a couple of months. The program began with Tim Wu's definition of net neutrality, which is essentially the principle of non-discrimination: All bits have to be treated the same, with no discrimination. Essentially, the "dumb pipes" argument all over again. This emphasis on non-discrimination reminded me of the first op/ed I wrote against net neutrality way back in 2006, in the early days of the net neutrality debate, entitled "Welcome to the Stupid Internet." The piece is no longer archived on the San Jose Mercury News site, so we keep it archived here. It's interesting to me that we are still at non-discrimination after all these years. Of course, David Isenberg didn't like it. But Richard Bennett did, as did Scott Cleland. Here's what I think is interesting: For those eight years, we did not have net neutrality regulations, and the Internet blossomed. So . . . doesn't that mean that net neutrality proponents were wrong, and that the Internet was just fine without net neutrality regulations? 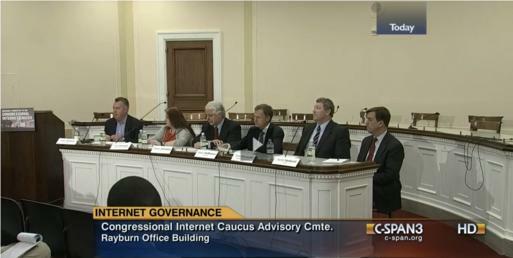 I was honored to speak at a panel discussion on Friday sponsored by the Congressional Internet Caucus Advisory Committee on whether transferring control of the Internet root zone functions from the U.S. Dept. of Commerce to some yet-to-be-determined multistakeholder organization is a good thing. The briefing was televised on CSPAN, and the archive video can be seen here. As an early opponent of network neutrality regulations, it’s tempting for me to characterize as a victory today’s DC Circuit Court decision throwing out some of the FCC’s network neutrality rules, and indeed it is a victory—in part, and for now. It’s true that the court threw out the most onerous rule on anti-discrimination, while also tossing out a symbolic anti-blocking rule that market proponents understand was completely unnecessary. But the Court agreed with the FCC on its authority to regulate broadband services, which means Verizon lost on its core assertion that the FCC had no statutory authority to regulate broadband networks. This is underscored by new FCC Chairman Tom Wheeler’s triumphalist reaction to the case. Everyone spins the results of important court decisions such as this, but the early social media reactions that “Verizon won and the FCC lost” were an uninformed oversimplification. Conservatives get off track on issues like privacy when they lose sight of the fact that government’s first priority is NOT to protect Americans’ security, but is rather to protect Americans’ freedom. If you assume that government’s first job is to protect national security, you are already on the thinnest end of the wedge that eventually leads to a surveillance state, which is simply the last bus stop just before a police state. Our system, including the justice system, by design correctly values freedom over security anytime the two come into conflict, which as it turns out is pretty often. So public horror at the disclosure of widespread data collection on the activities of ordinary Americans by the National Security Agency is entirely warranted. People realize that, while there is always going to be a tension between security and privacy, discovering that the federal government is building massive databases of our phone communication, Internet activity, credit card transactions and God knows what else suggests that the government has crossed the line and is prioritizing security over freedom. There has been a huge problem over the past few years with municipalities dragging their feet on approving permits to allow cell phone towers to be constructed, or even to allow new transmitters to be added to existing towers or to buildings. Municipalities have been doing this on purpose, largely at the urging of consultants, who suggest the delays at least in part as a way to extract concessions from the wireless companies. It’s been a big problem, with municipalities complaining to the wireless companies about poor service coverage and then at the same time unnecessarily delaying permits to address the problem. IPI has written about this problem several times, and one of the solutions we suggested was that municipalities should be put on a shot clock and given only a limited amount of time that they could delay such applications. Which the Federal Communications Commission (FCC) did. Upon which action the City of Arlington, Texas, which is just about 30 miles from where I sit, challenged the regulation, claiming that the FCC didn’t have the authority to regulate how they approved applications for cellphone towers.